All terminals can be accessed from the Garage Complex and roadways. Wheelchair access to all terminals is on level 1or level 4 on the west end of the Garage Complex. Curb cuts, ramps, level entrances, elevators and automatic doors are provided. Wheelchair accessible restrooms are provided at all public restrooms in the ticket lobbies, concourses and baggage claim areas. Veterans that have "DAV" or "DV" license plates on their vehicles, do not pay parking fees. You must use the cashier lane to exit the parking garage. Tell the cashier that you are a disabled veteran and have a, DAV, or, DV, license plate. 2. Contain specialized equipment for utilization by a person who has a disability, such as foot or hand controls, lifts or ramps. 3. Subject to Aviation Department verification procedures. Phones are in the ticket lobbies, concourses and baggage claim level. Amplified phones are available at each location. TTY phones for passengers with hearing and speech impairments are available in each terminal building. Locations are designated at each public phone bank. Courtesy Phone Boards with TTY phones are located in the baggage claim area of all terminals. The phone will connect callers to the Florida Relay Service and give directory assistance. Florida TTY / Voice Relay Service: 1-800-955-8770(V), 1-800-955-8771(TTY). Taxi/Yellow Cab: Taxicabs provide transportation for passengers with folding wheelchairs at no surcharge. 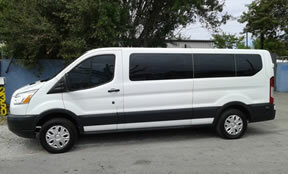 Wheelchair accessible vans are available at no extra charge, advanced notice recommended. Call Yellow Cab wheelchair taxi dispatch at (954) 565-2800. GO Airport Shuttle provides wheelchair lift-equipped vans at no additional charge. Advance notice is recommended. Contact GO Airport Shuttle. (954) 561-8888 or (800) 244-8252. 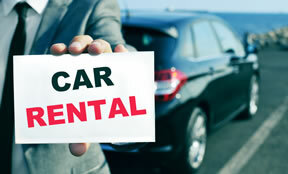 With advance notice, most car rental companies provide rental cars equipped with hand controls. Bus stops are located at the east end of Terminal 2, between Terminals 2 and 3, and the east end of Terminal 4, lower level. Tri Rail feeder buses and Bct Mass Transit both operate daily schedules. Call for information or visit their web sites. Bct Rider Info Line: (954) 357-8400 or 357-8320(TTY). Tri Rail Information: 1-800-TRI-RAIL (1-800-874-7245). Veterans that display "DAV" license plates do not pay parking fees. Use a cashier lane when exiting the garage. Before the cashier rings up your transaction, advise them that you are a disabled veteran and have a DAV license plate on your vehicle. Valet Parking is now available at the Airport. Follow the signs to the Departure (upper) Level and look for the signs. Cost is $8 first 0-2 hours; $4 for each additional hour; maximum $21 daily. For valet information, call 954-359-6931. The Fort Lauderdale Hollywood International Airport has an innovative feature installed for persons with upper body mobility limitations. An ADA Parking Access Feature has been installed at at all the parking facilities which allows patrons to access the parking lot without pulling a ticket. Vehicle information is recorded via speaker phone and remote camera and parking charges are calculated upon exiting the parking facility. Persons operating vehicles that display a Florida Turnpike Toll Exemption permit or that are specially equipped with permanently affixed hand controls, mechanical lift devices or ramps to allow transportation of disabled persons will be provided with courtesy parking , subject to Aviation Department verification procedures. 11 entrances with over 12,000 spaces. Daily is $1 per 20 minutes; maximum $15 daily. Hourly is $1 per 20 minutes; maximum $36 daily. Follow the signs to Hourly and Daily Parking. Note: Motorists picking up and dropping off passengers are encouraged to use Hourly parking which is 75 cents/half hour. Do not park overnight in Hourly Parking. The rate for 24 hours is $36.00. 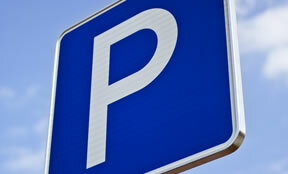 If you are parking overnight, plan to use Daily Parking, the Economy Lots. Designated disabled parking spaces are conveniently located in the Garage Complex. Wheelchair access to all terminals is on level 1or level 4 on the west end of the Garage Complex. If you are parking on any other level, take the elevator to level 1 and cross or ride the shuttle to the west end of the Garage Complex. The shuttles operate continuously on level 1. High top van parking is available throughout the Garage Complex. Contact your airline for flight information and for wheelchair service.